"Save as PDF" option as printer destination. The OCM Steel Guardrail Base System meets FEDERAL OSHA 1926.502(B)(3) and is capable of withstanding at least 200 lbs applied within 2" of the top edge, in any downward direction, at any point along the top edge. 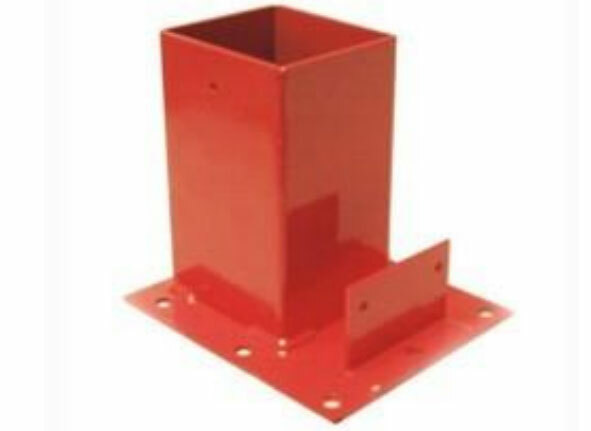 The OCM Guardrail base is reusable, built to last, and can be attached to wood or concrete. The OCM Guardrail Base includes a toe board slot for easy use with a typical 2" X 4" piece of lumber to make attaching a toe board simple and easy. All recommendations, statements and technical data contained herein are based on tests we believe to be reliable and correct; however, accuracy and completeness of said tests are not guaranteed and are not provided as an express or implied warranty. User shall rely on his or her own information and tests to determine suitability of the product for the intended use and user assumes all risk and liability resulting from his or her use of the product. In the event that a product supplied by OCM, Inc. proves to not meet the OCM, Inc. published dimensional or other specifications of the product, an OCM, Inc. representative will review such product and circumstances to determine whether a replacement is warranted. OCM, Inc.'s and its manufacturer's sole responsibility shall be to replace, at OCM, Inc.'s sole discretion that product or portion of the product which OCM, Inc. deems to be defective, within six months of the delivery of the product. OCM, Inc. disclaims all other warranties or conditions, whether express or implied, including an implied warranties of merchantability or fitness for any particular purpose. In no event shall OCM, Inc. or its parent or affiliated companies be liable for delay caused by defects, for loss of use, or for any indirect, incidental, special, or consequential damages or for any charges or expenses of any nature whatsoever. In no event shall OCM, Inc.'s liability exceed the purchase price paid for the particular affect OCM, Inc. products.